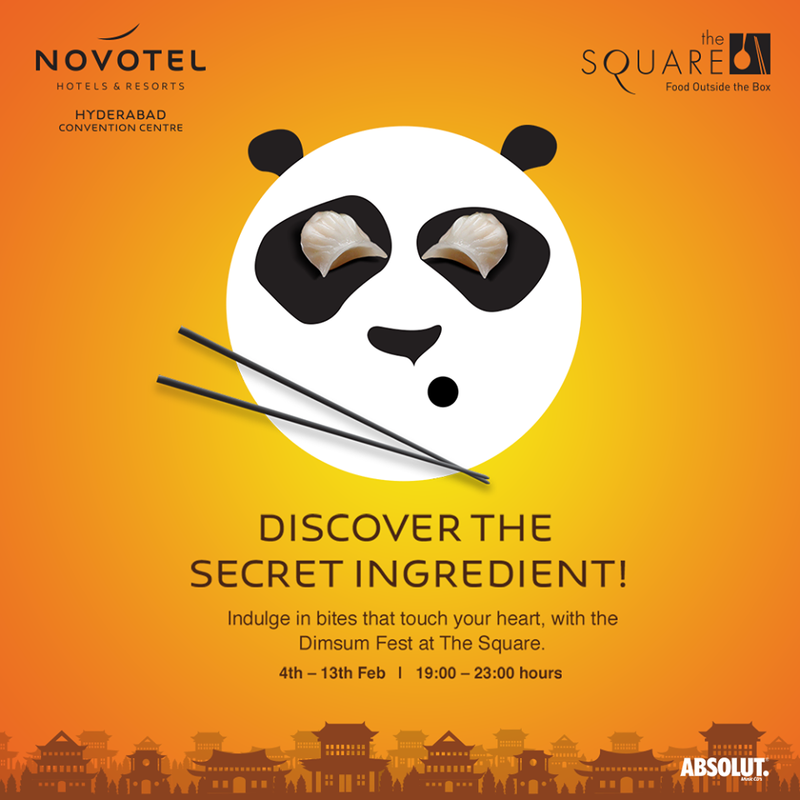 The Square, the all-day dining restaurant of Novotel, Hitech City is ushering in the Chinese New Year this year with a Dimsum festival. Chef Suraj Rai Adhikari from Pune, an expert in Pan-Asian food with a special love for dimsums, brings to Hyderabad his expertise gathered from his stint at Taj Land’s End few years ago under a masterchef from Cathay Pacific, as well as a number of dimsum festivals that he has curated in different restaurants. 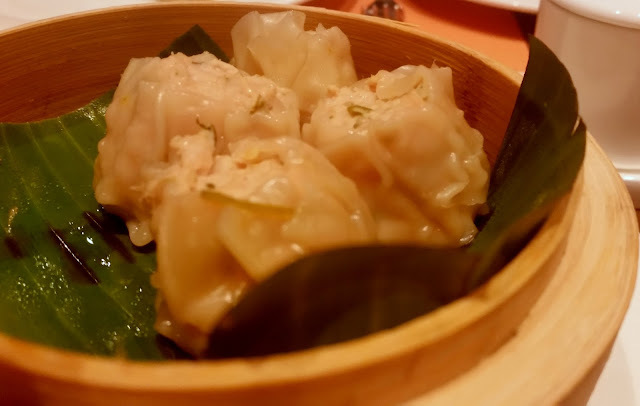 The dimsum promotion is part of the regular buffet at The Square. A separate counter has been set up showcasing the dimsums of the day along with select sauces and dips. Chef Rai has recipes for more than a hundred preparations of dimsums, and on a given day eight of them are being offered as part of the menu. 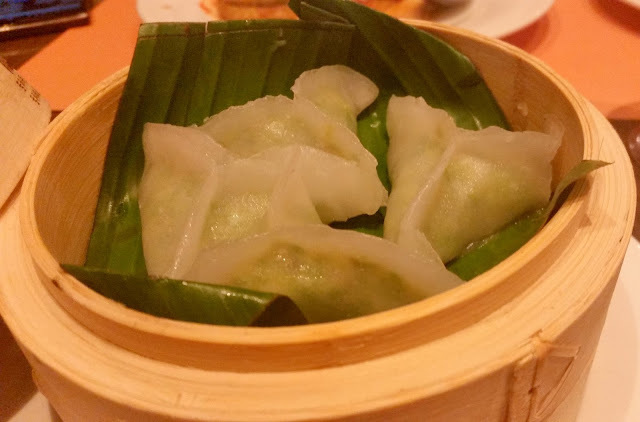 The skins or wraps of different dimsums have been prepared using different variations of flour such as lotus flower, tapioca starch and potato starch. A gluten free version of wheat flour is also being used in a few ones. On the day of the Chinese New Year, we were invited by the restaurant to sample the dimsums for the day. We did a recce of the dimsum counter and lost no time in digging into the bite sized delicacies. Prawn Har Gau had succulent prawns stuffed inside a translucent wrapper. 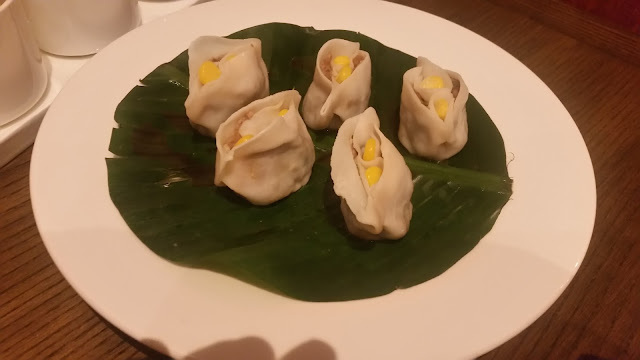 The dimsum wrap here consisted of lotus flower in the dough. Chicken Siu Mai had wraps shaped as dough pockets, had liberal quantities of chicken, and this was one of the most popular dimsums on our table. The vegetarian version had Black Eyed Beans in it. 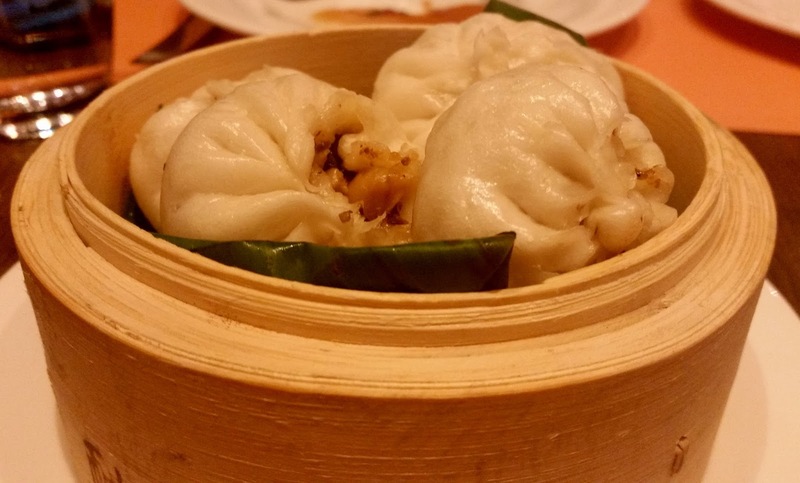 Bao is a round dumpling with a round and thick bread like outer layer. The dimsum fest had two varieties of baos, with a Burnt Garlic and Mushroom filling for the vegetarians and Barbecued Pork for the porkaholics. My favorite was small round shaped Juicy Lamb Dumplings, the stuffing inside which was spicier and tasty. The best among the veg versions was a dumpling of mild green colour, which had crunchy Water Chestnuts and Asparagus in it. 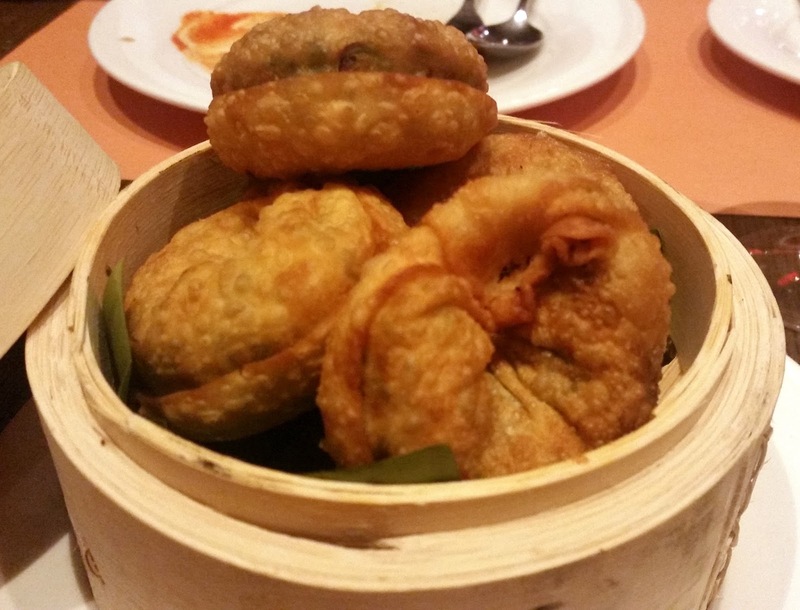 This offering literally “touched the heart”, as per the meaning of the word dimsum in Chinese. The crispy fried Beijing Onion Cake was the only fried dimsum on the menu. I am not a big fan of fried dumplings, so chose to sample only a little bit and concentrated on the other steamed ones instead. A special mention has to be made of the house-made sauces and dips served with the dimsums. Of the varieties served on the day, the black bean and soya sauce was the most popular. I loved the one with vinegar and chives, which went well specially with the thicker baos. 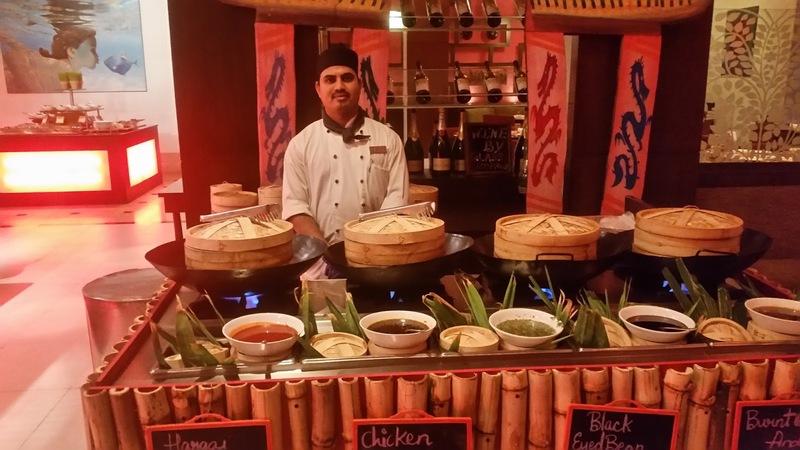 Another Chinese New Year Day special was the Roast Duck served in the buffet. The duck glazed with hoisin sauce tasted heavenly. 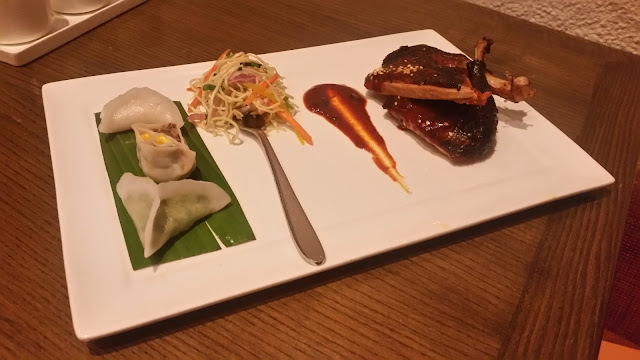 We were offered a few different presentations of the roast duck – in the first instance, it was rolled inside a pancake. 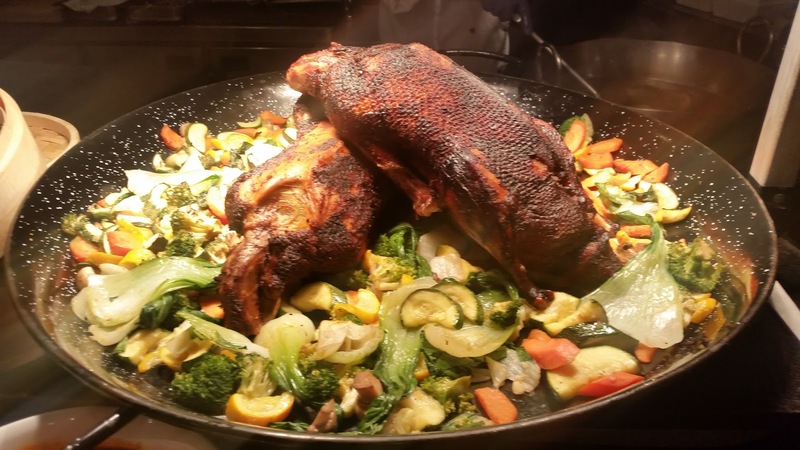 We also tried the duck with a liberal dousing in the hoisin sauce with sautéed veggies as sides. The duck was well cooked softening the meat as well as the bones, and especially the skin glazed with the sauce was finger licking good. The Dimsum promotion will be on till 13th February as part of the dinner buffet. A menu consisting of eight varieties of dimsum will be presented on each day. 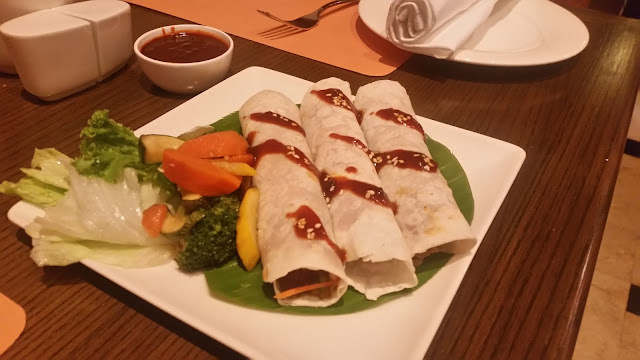 Apart from the dimsums, the buffet has usual starters, mains and desserts. Please note that the Roast Duck was a specialty for the Chinese New Year day only. Wow yaar.. how do you manage to get invites for such amazing events.. yumm food!! !